Kolkata Knight Riders hosts the league Leaders Chennai Super Kings at their home ground, Eden Gardens on 3rd May. Both the team are what we call ‘The Giants’ in Indian Premier league and we will be providing you betting tips to help you score a sixer for your every buck. It has always been a battle to look out for, with the last meeting turn out to be a nail biter for the fans, where the Super kings came out as triumphant, thanks to Sam Billings 56 Off 23 balls which included 5 sixes, precede by a good opening partnership between Shane Watson and Ambati Rayudu. Where Dhoni’s Chennai sits comfortably at top of the table, it would be a chance for a rebuttal for Dinesh Kathik’s Kolkata for the defeat suffered at Chidambaram Stadium. Currently KKR is been challenged by the royals to make their place into the playoffs. The game will be crucial from Kolkata’s point of view since their chance of getting through the next stage depends on the result they get out of the fixture. Dinesh Kartik is leading from the front, taking his total to 235 off the eight innings so far. Chris lynn has scored 248 runs so far and he will be looking to add more to his account. The aussie has in the bowling department, Sunil Narine has taken 8 wickets in 8 innings so far, adding to his 161 runs with the bat. The skipper is blazing all guns with his run total has reached to 286 with an average of 71.50 . MS has already surpassed the count of sixes with 26 so far, more than any he managed in the last 5 seasons. Another plus point CSK have their disposal is their openers, Ambati Rayudu and shane Watson. Both have managed the score 651 runs off the first six matches and could turn out to be the Aces of Spade for the visitors. Cricket tips favour the fortunes of captain cool. Medium pacer shardul thakur has took 8 wickets off six matches so far. DJ Bravo has taken 7 wickets so far. All Rounder Shane Watson can also contribute with the ball, having notched up 6 wickets so far. Although the eden gardens pitch is covered with grass and supposedly help the seamers in swing . It has also been expected to help the spinners to play a role in turning the game. It will be great turf to play a match between two well balanced team consists of seamers and spinners and some very explosive batsmen. Be ready for fireworks. Csk has an upper hand in the tie with the Chennai based franchise winning 11 matches, compared to 6 won by the Kolkata Franchise, off the 17 meetings they had so far. Clearly it would be a psychological advantage for the visitors, after winning the previous game of the 2018 season. Seeing the recent form of both teams and star players performing to their potential, this one could be one tough one to guess but Chennai can narrowly turn out to be a one to watch for in the fixture. They boast the in form Mahendra Singh Dhoni, batting down the spine of the line up. 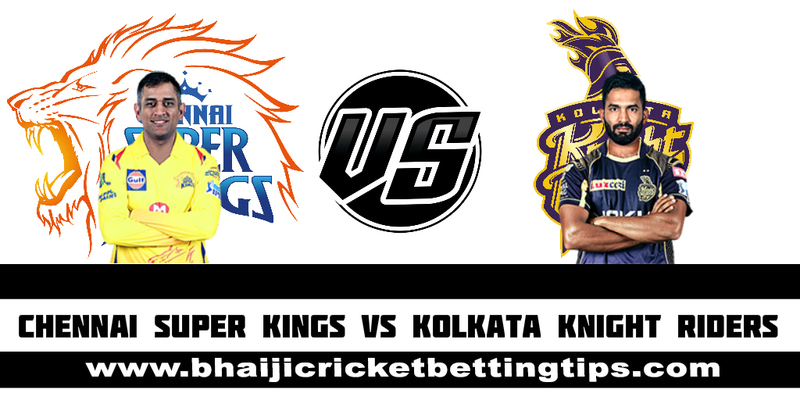 Kolkata has advantage of playing in the home ground, which also turned something of a fortress for the team, but that may turn out to be feeble in front of a solid well rounded Chennai Super Kings. Welcome to bhaijicricketbettingtips.com, where we provide you with accurate cricket betting tips, through an in depth research and analysis, ranging from weather, forms of players and playing conditions. We also provide with tips from the top bookmarkers in the industry. We provide tips from tests, one day internationals, t20s and IPL matches.